The Japanese art of paper string-making is called shifu. While its precise origin is largely unknown, shifu is said to have been invented at the beginning of Japan's Edo period, when other materials were difficult to acquire. Today, clothing makers and textile artists use this simple method to create one-of-kind spools that reflect their own aesthetic styles. 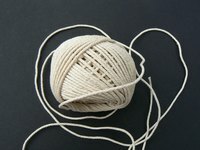 Paper yarn can be made from fine-quality paper, newspapers and used notebooks found around the house. The yarn is durable, making it suitable to use in a wide variety of crafts including jewelry making, book binding and weaving. Making paper yarn can be a fun family activity as well as a serious avenue for creative expression. Cut a strip of paper approximately 1 centimeter in width. The thickness of your yarn will vary depending on the width of your strips. The length of each strip should be at least 10 inches to ensure your string's strength and durability. Twist the first strip with your fingers in one direction to create your lead. Tie the lead to the spindle. This will create an anchor for your spool. Continue to spin the strip in the same direction as your lead. Leave 4 inches untwisted at the end of your strip. Cut a second strip the same width as the first. This will help to prevent budging or weak links. Align the new strip on top of the 4-inch end and twist together in the same direction as your lead. Repeat cutting new strips, splicing and twisting until your string has reached the length you desire. If you do not have a spindle, you can tie the leader to any object that will provide tension while spinning. Beware of knotting your yarn if you are not using a spindle. Experiment with different strip colors, densities and widths to create a spool of thread specific to your needs. Using old newspapers or scrap notebooks can be a fun way to recycle items commonly found around the house.